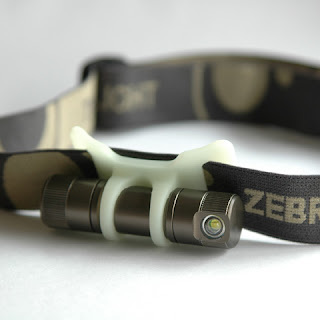 The Zebralight is one of the first headlamps in the market using the ultra bright and efficient Cree LED. The H50-P4 model features an XR-E P4 bin cree LED powered by a single AA battery. The headlamp construction is not common, in fact it seems to be an AA flashlight with the LED mounted in a side that was then converted to a headlamp passing the headband thru a piece of GITD plastic that holds the light. The Zebra has three brightness levels activated by a twisty switch, you go from off to minimum then off then medium, off again and then maximum. Brightness is 2, 10 and 50 lumen and runtime is 2 hours 20 minutes in max, 19 hours in med and 3.5 days in low mode. The beam is all flood with little or no throw at all, making the light excellent as a tasklight and indoors headlamp but not good for trails or outdoor activities. For reading in bed, a tent or to work the beam is just perfect. The twisty switch is definitively not practical for a headlamp and while it can be activated with one hand it will not be something that you enjoy in the long run. While it seems the beam will be offcentered due to the position of the LED in the light the extreme floody beam makes this go unnoticed. The total weight is 58 grams and it can use alkaline, NiMh or a lithium battery, it is confortable and almost unnoticeable, the glow in the dark bracket is a good detail to find the light in the dark or provide a glow if it has been charged during the day. If you are looking for a simple all-flood headlamp definitively check the Zebralight out, if you need a headlamp for hiking or trails skip, you need something else. You can order from Zebralight for $39.